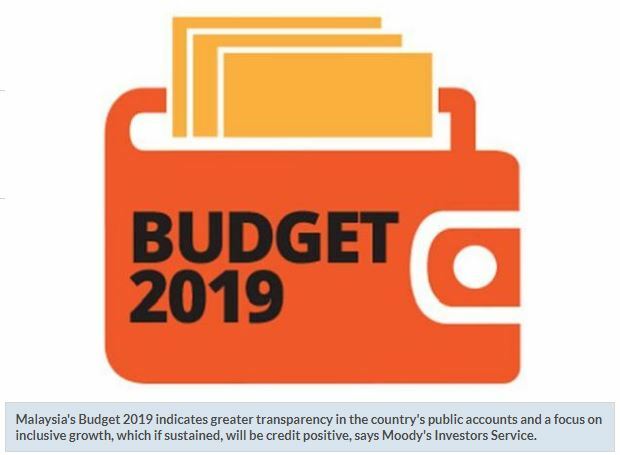 KUALA LUMPUR: Malaysia’s Budget 2019 indicates greater transparency in the country’s public accounts and a focus on inclusive growth, which if sustained, will be credit positive, says Moody’s Investors Service. “However, in the near term, a still high fiscal deficit and heightened reliance on volatile oil-related revenues will weaken Malaysia’s fiscal profile, a credit negative,” it said in its just-released report. On Nov 2, Malaysia’s (A3 stable) finance ministry released its Budget 2019, the first for the Pakatan Harapan government that took power in May 2018. However, projections for 2018 are above original budgeted targets of 2.8% of GDP. In 2018, higher dividends from state-owned oil company Petroliam Nasional Bhd (Petronas, A1 stable) will not bridge revenue losses from the switch to a Sales and Service Tax (SST) from the Goods and Service Tax (GST) and higher spending� on fuel subsidies and salaries and emoluments. “The achievement of a slightly narrower deficit target of 3.4% of GDP in 2019 hinges on cuts in operating and development spending, and the government will also draw on a special, one-off dividend from Petronas to pay past refunds owed� from input tax credits on GST,” it said. Moody’s said the budget also indicates that Malaysia’s high debt levels are likely to persist for longer than expected as deficits are likely to remain above 3% of GDP until 2020. “In the near term, it is likely that any further deficit reduction will largely rest on securing revenue from non-tax sources, including higher dividends from state-owned enterprises, and/or by continuing to cut spending. “At these levels, debt remains higher than the A-rated median forecast of 40.9% for 2018, emphasising fiscal constraints as a key credit challenge. “Moreover, with the replacement of GST with SST, petroleum-related revenue has increased to about 31% of total revenue from less than 16% in 2017, making government income susceptible to oil price volatility,” it said. Moody’s also said a number of measures, both implemented and planned, reflect the government’s drive to increase the transparency and accountability of the public accounts. However, disclosure of the size of “committed government guarantees” – that is guarantees to entities that require regular financial support — could add up to 10.5% of GDP to future government debt. It said this was because there was greater likelihood that some of these entities’ debt payments will be assumed by the government.